The capture of Osama bin Laden will be toasted locally on New Year’s Eve with a $10,000, 141-year-old bottle of wine. The libation will be the result of a bet made by Monterey restaurateur Ted Balestreri, co-owner of the Sardine Factory on Cannery Row, at a dinner party last New Year’s Eve with 28 friends in the restaurant wine cellar. Among those in on the bet: then-CIA Director Leon Panetta and his wife, Sylvia Panetta. 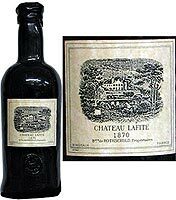 It was a bottle of 1870 Chateau Lafite Rothschild, “and I told them I wasn’t going to serve it up,” he said. Balestreri said that at the time, he was kidding. Five months later, on May 1, he was having dinner at the Monterey Peninsula Country Club with friends when he received a phone call.